Our range of floor tapes are available from stock, which we've selected based on their individual properties. Floor tape comes in several materials and prices which reflect their durability and performance. This is the cheapest and most used in the UK because of how quick it is to install and it's low cost. Companies using PVC are generally not concerned of its strength and longevity, they are looking for a quick and effective fix to their storage or safety requirement. A higher grade of floor tape is Permastripe, this is the latest development in low cost floor marking and manufactured from 1mm industrial grade PVC, which creates a piece of plastic that is near impossible to tear. As this warehouse floor marking material is so tough, it is easier to apply than regular PVC floor tape and it’s resistance to tearing allows it to be removed in one piece when you are ready to reconfigure your layout. 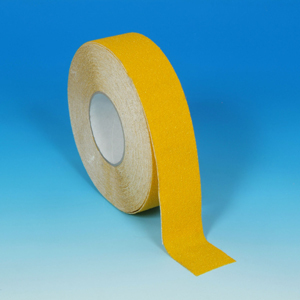 Anti slip tape is constructed to perform in the same way as any other type of tape, it is flexible enough to deal with undulations, self adhesive backed and produced with high contrasting colours so it stands out against almost any surface. Equally there are enough colours to help it blend. 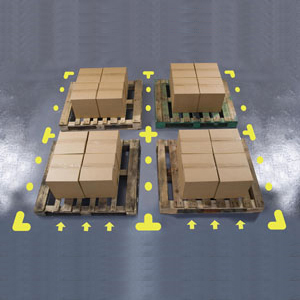 Warehouse pallet markers are designed to replicate line marking which is used to show pallet locations on warehouse floors. Our self adhesive markers are quick to install, low cost and more durable than regular floor tape. 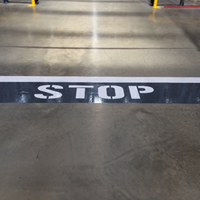 Rack and Shelf Labels provide several methods of floor marking from industrial coatings to floor tape. Within our floor tape range is an especially strong material called Permastripe that is a 1mm thick PVC based product with a self adhesive backing. Pallet markers are produced from a similar material which makes them the toughest self adhesive floor marking product available. Pallet markers are designed in various shapes which when combined form effective marking systems. Using pallet markers helps save money because less material is used, and using them with rolls of the tape will help you achieve a low cost, floor marking system. We recommend that pallet markers are applied to smooth floors which have been thoroughly cleaned and dried for best results. We provide a primer that when applied to a surface enhances the strength of our self adhesive products. This helps them perform better inside and out.